Big Blue waking up in Liberty Glen Campground, above Sonoma Lake. Big Blue atop the hill outside the entrance to the campground. Blue at the Dry Creek General Store. Word is, this is some type of insiders secret winery and all their wine sells out. Wine and Spirits magazine said of their Zinfandel, "Rafanelli is a zin legend in Dry Creek, and this wine clearly demonstrates why. Get on the mailing list"
We tasted a Cab and a Zin from the barrel and it was great, but the place was cash only and EP and I had said we weren't to buy any wine this trip. So we moved on, thanking our VW friend for the prime spot as we left. 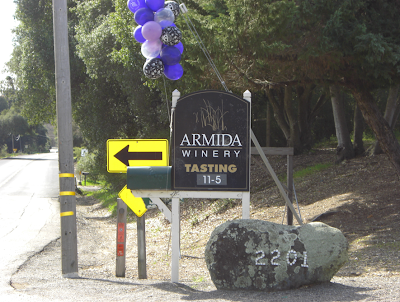 Armida - skip it - too many gimmicks, not enough good wine. Their wines were a disappointment. We tried a Chardonnay, which was so unremarkable that I don't recall how it tasted, and a Pinot and 2 Zins. Skip this place unless you are looking for a party. 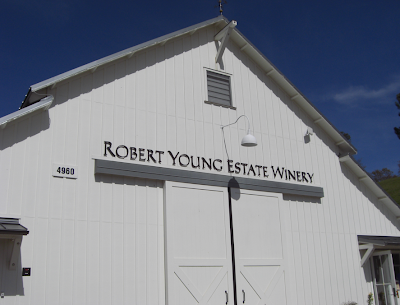 Robert Young can thank his grandfather for the warmest spot in Alexander Valley. Our next stop was Robert Young. For four generations, the Young family has been located in the old house here on the property. Originally, the great grandfather came out for the gold rush and ended up settling on some land at the north end of Alexander Valley, northeast of Healdsburg. 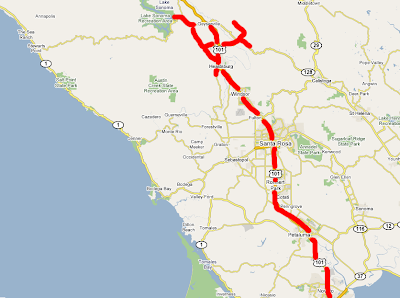 They continued to mine the hills between Napa and Sonoma for silver, but also planted the land they owned with prunes. In the 1960s, Robert Young decided to plant grapes instead, and the rest is pretty much wine country history - they opened the winery in the late 80s or early 90s (I forget) and now specialize in a Bordeaux-style red called Scion. They chose the name Scion because of the whole double meaning of grafted grape wines and them being the fourth generation in the business. Sort of a Family vine rather than a family tree. We met a few of the Youngs, as it seemed to be all family members that were working there. All very nice and -- getting on to the wine -- all pouring great wine. We tasted the 2003, 2004, 2006 (still in the barrel) Scions along with their Chardonnay. The 2003 was fantastic, but I'm pretty sure any of them would have done just fine. 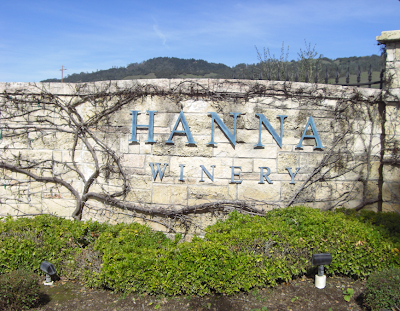 On to Hanna Winery. 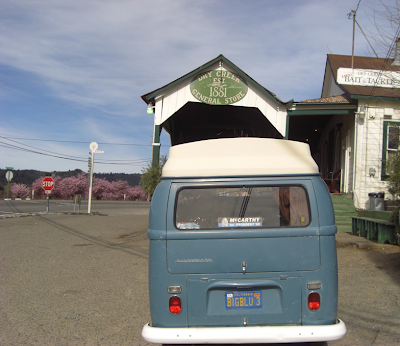 Wrapping around Healdsburg, the winery sits northeast of downtown on highway 128. The tasting room is great - nice, but not too much. I sat this one out for the most part, but the wine I did try wasn't mind-blowing. EP liked it a lot. Hanna Winery had a really nice tasting room. We parked Big Blue in the "Bus Parking" at Hanna. They were barrel tasting a Riesling that we will go back for in 2 months when they bottle it. It was fantastically floral without the honey taste that usually consumes Riesling. 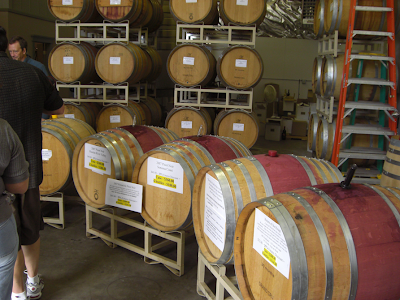 He was also barrel tasting 2 Pinots, same French oak barrels, same grape, grown about 20? 30? miles apart. One grown in Russian River and the other grown over the mountains closer to the coast. The result is what you may expect. The coastal grapes need to be tougher than the ones near the river, so they have thicker skins, resulting in a more full-bodied wine. Both good, but the Russian River Pinot had a smoky finish that was pretty fantastic. EP ended up joining their wine club and braking our rule that we weren't going to purchase any wine on this trip since the cellar is full as it is. But it was probably a good idea. Especially if they include that Riesling in the club shipment. 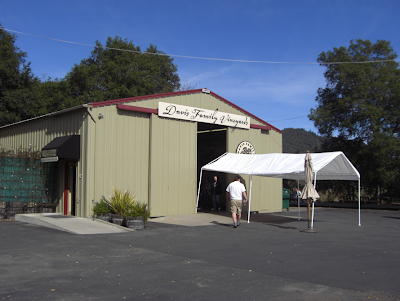 The warehouse that is the Davis Family Winery just on the outskirts of Healdsburg. The barrel tasting aftermath - the stained red barrels at Davis Family Vineyards. And that was it. We gave our glass to an old guy who wanted the anniversary glass and pointed Big Blue home. He ran great, and with the back country roads, was very comfortable with the speed of traffic. Not to mention how many people commented on him, waved, or gave us a smile. 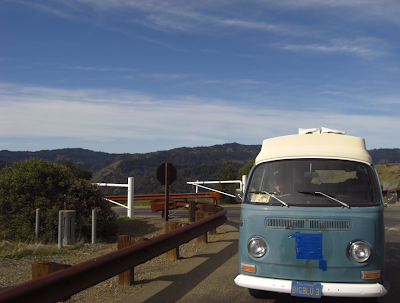 Big Blue may be the perfect wine country car. That, or the wine I drank made just me think that was the case. Hitting the wine trail in a Bus is a great idea. Great post! Mort's owners! Welcome. 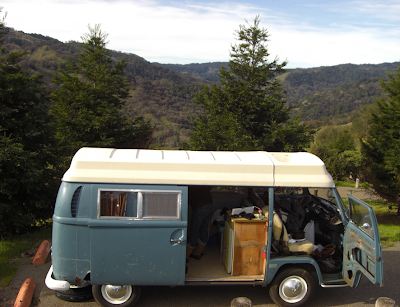 Big Blue is a '68 panel that was made into a camper back in 69/70. 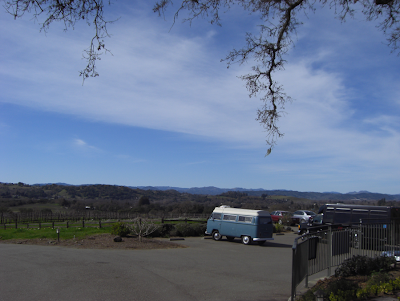 Yeah, it was a great trip up there and it was fun to explore wine country at a slow pace. Are you guys in California? I'm adding a link to your blog on our site.